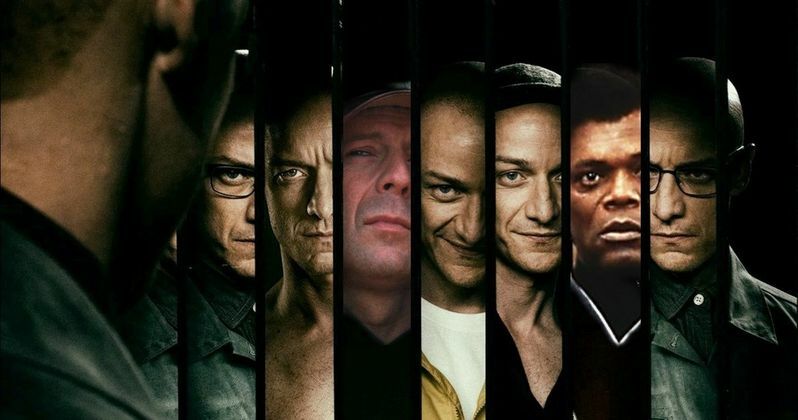 If you've been living under a rock, or have given up on M. Night Shyamalan as a filmmaker, you might not know that his latest movie Split is a sequel to his hit 2000 superhero drama Unbreakable. And now the man is making a trilogy ending third film that will tie the worlds of Unbreakable and Split together. It's called Glass, and it stars Bruce Willis, James McAvoy and Samuel L. Jackson all reprising their roles. Today, we have the official synopsis for this impending thriller, which M. Night Shyamalan only recently finished scripting. In the late 1990s, heading into the 2000s, M. Night Shyamalan was seen as a wunderkind filmmaker often compared to Steven Spielberg. Especially with his enthralling twist ending for The Sixth Sense. His next movie wasn't as big of a hit, but Unbreakable instantly scored a legion of fans for being an incredibly smart superhero movie before the big boom in the genre that we're living now. But soon, Shyamalan bought into his own hubris, and his movies became a laughing stock. He was seen as a filmmaking failure who turned in one disaster (The Happening), after the next (The Airbender) after the next (After Earth). He turned his misfortune around with the low budget Blumhouse hit The Visit. He followed this up with this year's Split, which became one of the biggest money makers of 2017. Now he is taking that movie, and turning it's sequel into a follow-up to Unbreakable as well. Today, we have an official synopsis courtesy of Cosmic Book News, that teases the impending flight between Bruce Willis' David Dunn and James McAvoy's The Beast. Here's the story that will play out. "Following the conclusion of Split, Glass finds Dunn pursuing Crumb's superhuman figure of The Beast in a series of escalating encounters, while the shadowy presence of Price emerges as an orchestrator who holds secrets critical to both men." Split features James McAvoy as a man named Crumb, who suffers from multiple personalities. He kidnaps a couple of young girls, with Crumb's true nature proving to be more terrifying than originally thought. Crumb's story will continue in Glass, which is named after Samuel L. Jackson's Elijah Pryce character in Unbreakable. It isn't revealed yet how Pryce will play into this madness. Main captive Anya Taylor-Joy, perhaps best known for her striking turn in The Witch, will also return to face Crumb. And if you've seen the movie, you know she's quite the survivor. Sarah Paulson will join the ensemble as a new character added into this toxic mix of good and bad guys. Split stands as its own unique movie, and it isn't until the final moments that the Unbreakable connection is revealed, with Bruce Willis' David Dunn emerging from the shadows at a dinner to comment on the Crumb situation playing out over the news. Shot on a slightly bigger budget than The Visit or Split, Glass will still be a modest affair, and should be a huge hit when it opens, presumably next year. Now, with this synopsis, we know what we're in store for. And it should be one hell of a good time. Shooting Begins in September on the trilogy ending sequel.